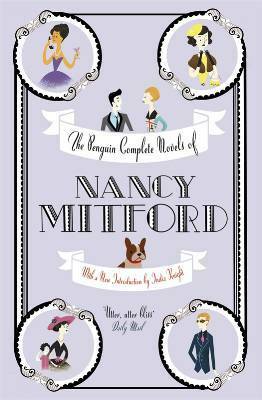 Nancy Mitford wrote eight novels in all; often split into her ‘pre war’ and ‘post war’ novels. This collection contains them all: Highland Fling (1931), Christmas Pudding (1932), Wigs On the Green (1935), Pigeon Pie (1940), The Pursuit of Love (1945), Love in a Cold Climate (1949), The Blessing (1951) and Don’t Tell Afred (1960). The pre and post war novels are very different and, also, both the first two novels and the final four, although stand alone books, share characters. So it is nice to read them all in the order they were written in.The first two novels, “Highland Fling” and “Christmas Pudding” are light hearted romantic comedies. The first involves a house party and a generation clash between the older members and the ‘Bright Young Things’. Christmas Pudding sees author Paul Fotheringay staying, undercover, at the house of Lady Bobbin to write an unauthorised biography of one of her ancestors. The third pre-war novel is “Wigs on the Green”, a satirical look of the rise of fascism in 1930’s Europe. Of course, Nancy Mitford was well placed to cast her sharp eye on events – her sister Diana was married to Oswald Mosley and her sister Unity, infamously, flirted with fascism. This book was much edited, but still caused a huge family rift and, wisely, Mitford left it out of print after the war – where it remained for over seventy five years. It is interesting to read, but her least successful novel in my opinion. Pigeon Pie, written during the early months of WWII, sees her back on more assured ground with a comedy, in which Lady Sophia Garfield uncovers a nest of German spies. Doubtless, the war changed Mitford. For one thing, she fell desperately in love. Her masterpiece, The Pursuit of Love was published in 1945 and dedicated to her lover, Gaston Palewski (read The Horror of Love if you are interested in discovering more). This novel introduces Fanny, who features in three of her last novels and is linked to characters in all four of her post war books. The Pursuit of Love follows Fanny’s cousin Linda and her love affairs – including that of French aristocrat Fabrice Sauveterre. Both this and the following Love in a Cold Climate are more mature, slightly darker and wonderfully written. Love in a Cold Climate again features Fanny narrating – this time the central character is Polly Hampton, as heiress who makes an unsuitable marriage. The Blessing is more of a stand alone, although characters are linked to the previous two books. We read of Grace, daughter of Sir Conrad Allingham, and her marriage to Charles-Edouard de Valhubert (a relative of Fabrice Sauveterre). Son Sigi is ‘the Blessing’ of the title, who uses his parents marital difficulties to his own advantage. In the last novel, Don’t Tell Alfred, Fanny takes centre stage, when husband Alfred becomes Ambassador to Paris. This novel deals with the generation gap again, as Fanny’s sons cause all kinds of problems for her, with strange Teddy Boy clothes and bizarre tastes in philosophy and music.These books really are a delight. Although they are funny and charming and written with great humour, they are never sentimental. Mitford has a wicked, often cruel, sense of humour and a sharp and satirical eye. She wrote of the world she knew, in all its absurdity and was not afraid to lampoon herself, friends and family. Nobody should be a reader and not know Uncle Matt, the Bolter and hypochondriac Davey. If you are coming to these novels for the first time I envy you – utterly enjoyable and completely unforgettable. Long, but the later novels are worthwhile. Well. This was interesting. Jane Austen meets P.G.Wodehouse. Due to Ms Mitford writing on both sides of WWII there were some very unfortunate "jokes" about fascism, which don't quite carry well to the post-war world. Some of the cheer in her writing took time to recover too, and there are a couple of more serious novels immediately after the war, although there is always a humorous surprise at the end. Like with Wodehouse, marriage always seems the result of some ridiculous misunderstanding, or misinformation, and happiness in the matrimonial state is purely a matter of luck/chance. No doubt this is accurate, so it's almost a shame so much time is wasted on courting nowadays, when one could just dive in to provide a good laugh to spectators.It was a struggle to read through to whole tome in one go, and I would recommend splitting the novels among other reading. On the other hand, it's fascinating to be able to follow the development of a writer.Light, funny reading with a sad, cynical undertone.